This is one of the few reasonably priced feather down comforters we found in a generous king size. It fits well in our duvet cover with ties. It has attachment sites for ties in all four corners and halfway down each side. We got it at the end of winter but did get to use it on some 30F nights and it was very warm. Personally it is warmer than I prefer so I just keep it over my legs. Excellent quality and it fluffed up quickly after a spreading and shaking it. The Traditional White Down Comforter is made with exquisite 100-percent European White Down and snuggle soft 350-thread count cotton sateen fabric. The baffled box design provides a lofty appearance that makes you want to jump right into bed. This comforter is exactly what I was looking for. It is medium weight, but nice and fluffy--for luxurious comfort and warmth. It came packaged in a sturdy box with a plastic zippered "case", and was not compressed too much, so it was great right out of the box. I slept so much better last night! Added features are small loops on each side, and at each corner to help secure it if using with a duvet cover. The fabric is soft and the edges are double stitched with a pretty, thin, satin-like edging. Love my new comforter! OMG... There are truly no words for how much I love this Down Comforter!!! It is a great size for our extra large King size bed (Sleep Number) The Quality is top notch for the price... I believe it will last for years to come. Every night when we go to bed I feel like I am sleeping in a Luxury hotel with this super cozy comforter. Also, it is very warm, not sure I will be able to use it in the summer. We are pretty happy with the purchase of this down comforter. Although we would have liked it to be a little "puffier", for the price and being responsibly sourced we are very happy. I love the feel of this comforter, it feels like a big fluffy pillow. The size was perfect for the king size bed. I would recommend this to anyone that loves the soft feel of a comforter. I am never going back to regular comforters. Love it! This is an amazing comforter. Very large and hangs just right on my king size bed. It is so light and fluffy! Very true to size. Highly recommend! I love, love, love the way this feels! It is just the right weight and warmth and it is currently the dead of winter. I have no other blankets on my bed just this and the sheets. Between this and my new foam mattress (also Overstock) I have been sleeping wonderfully! I love the quality and style but the king was a little short. I love this comforter, you can use it as is or it is perfect with a duvet cover. It’s cozy and warm. It keeps its shape and is easy to clean. Just what I wanted. For those who did not understand this: You must open up and fluff out any new down comforter, and then let it rest - spread out - for several hours to expand fully after shipping compression. You also need to shake it out VERY VERY WELL... as in you may be tired after shaking it out properly. just right. not too heavy or thin. Super fluffy and warm. Looks beautiful. 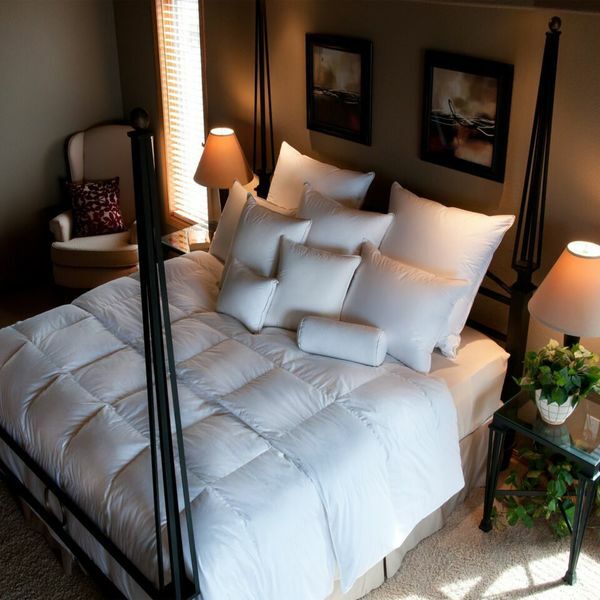 This comforter added the perfect look to our spa like room. Have to unfold to let "fluff" again. It is smashed from being packed. Love the feel of down. "is this comforter machine washable and is there a warranty"
"when ordering a size: King Comforter, which comes closest to the California King size? King - Grand King or Super King?" "when ordering a california king size comforter, is that the same as "king", grand king or super king?"